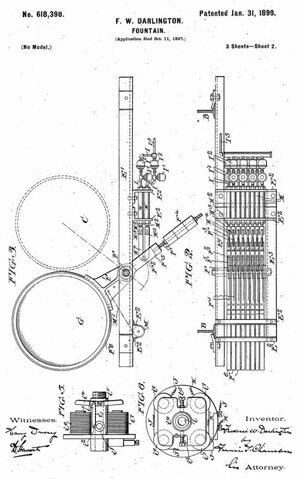 Frederic W. Darlington started to apply for patents for his remotely-controlled color changers and other fountain equipment in 1897. He received his first patent in January, 1899 and continued to receive fountain equipment related patents as late as 1917. The illustration to the right shows the plan view of the paddle-like arms that contained the colored glass filters. A group of filters would be stacked over the light source (as seen in the sideways elevation view of figure 2) and the pneumatic pistons would swing the filters, a single or in combination, into place over the light. The compressed air would be valved on and off with electrical signals from levers on the control console. Original fountain lighting with arc lights and F.W. Darlington�s patented color changing mechanism. The plates above the lights held glass slides that were rotated into position to color the light going up through the ceiling of the fountain vault and funnels in the water to light the water shooting up from the fountain nozzles. This mechanism was pneumatically actuated and operated by electrical remote control from the roll-top desk in the control room in the north tower of the pavilion.